Don't you just love it when a card is beautiful AND simple? 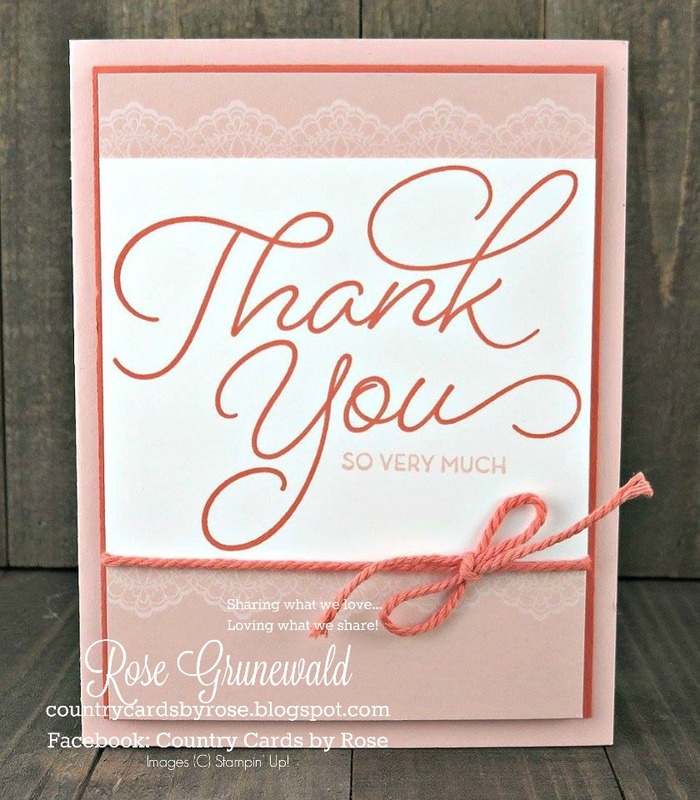 The So Very Much and Delicate Details sets from the Sale-A-Bration flyer are amazing and great to pair together for an elegant, but quick and simple card. Don't you just love this card? My friend Dena made it! I love the color combination of Blushing Bride and Calypso Coral. This is one I'll be sure to use on more of my cards! 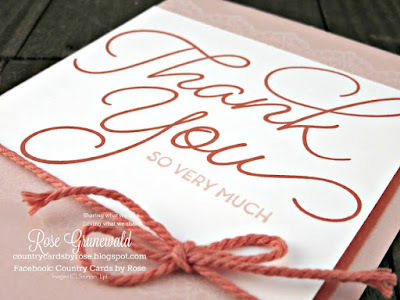 This card is so beautiful, I just had to share it with you along with instructions so that you can make it yourself! Stamp “Thank You” on White Panel in Calypso Coral ink. Add additional sentiment in Blushing Bride Ink, if desired. 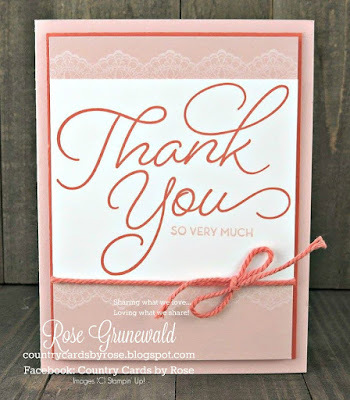 Using Whisper White Panel as a guide (don’t adhere yet), Stamp Lace image above and below position of Whisper White cardstock onto Blushing Bride Panel in Whisper White ink. Adhere Whisper White Panel to Blushing Bride Panel. Tie Calypso Coral Thick Baker’s Twine around Blushing Bride Panel. Pop up panel with dimensionals centered onto Calypso Coral panel on card. Oh my! Isn't that card super easy? 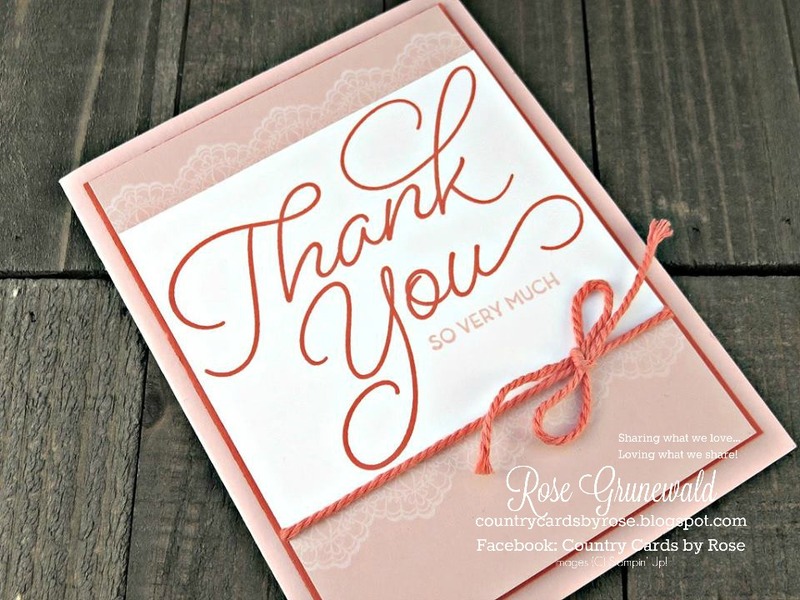 This would be a great card to add to your stash! You can click below on any of the products used to make this card to go directly to my online store. These stamp sets are from the Sale-A-Bration flyer, so you get them FREE with a $50 order. If you have any question son this promotion, please send me an email or comment below, and I'll be happy to help!